We’ve all been there, your suitcase is packed nicely, and you have your latest must-read novel tucked inside for the relaxing afternoons by the pool. Then, you get to your destination and open your case only to find your shampoo has popped during transit and your book now smells of lavender and is a sticky shade of pink! This scenario can be changed, however, with the simple addition of a waterproof case to protect your precious papers and books. Of course; there are many times when you take out items that need to be protected from damp and moisture alike. The reasons we can benefit from using protective water-proof cases is vast and will vary from person to person, you may be a natural wanderer who believes in the trust paper map for instance; the last thing you want is your way to and from a destination to be unreadable through water damage. And even for a regular commute on a daily basis, although there are many technologically advanced ways to carry information, sometimes only paper documents will do. If you don’t possess a weather-proof backpack (which, let’s face it – not everybody does! ), then chances are you will get caught out. If not by rain or damp air, then there is the loosely done up juice bottle popped in your bag before you leave in the morning. The possibilities and great reasons to use a water-proof case are far too many to make a comprehensive guess list of, but you get the idea. Our recent advanced tech is another valuable reason for carrying a water-proof case, and it’s not just your beloved cell phone that needs protecting from the elements. This ten of the best review will highlight the best available variations of water-proof cases available today; and should give you an idea of the different types, styles, and sizes that are currently on the market. This waterproof case is ideal for protecting a cell phone from snow, dust and water. It is available in a three-pack with a choice of different color variations. It boasts having an IPX8 rating that enables the use in water and even through water spray without damaging the contents. It is versatile for a number of cells, and benefits being completely compatible for any phone up to six inches long. The clear design allows visibility even in water and allows photographs to be taken underwater with the touch method and through using volume buttons. The ABS materials are embedded within the locking system and is simply completed with a quick turn of the switches on the top. It prolongs use and increases durability with the scratch resistant and wear resistant manufacture. 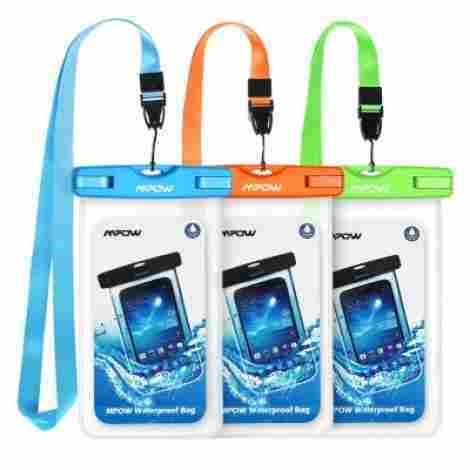 The Mpow waterproof case is designed to be functional but still stylish, the color combinations in the packs will appeal to most and it has a useful lanyard to keep hands free for better safety and quick access. The overall cost and value of this set of three waterproof cases is well reflected with the features including the wear resistance, scratch resistance, and touch sensitive capability ensures that this case is excellent value for money. 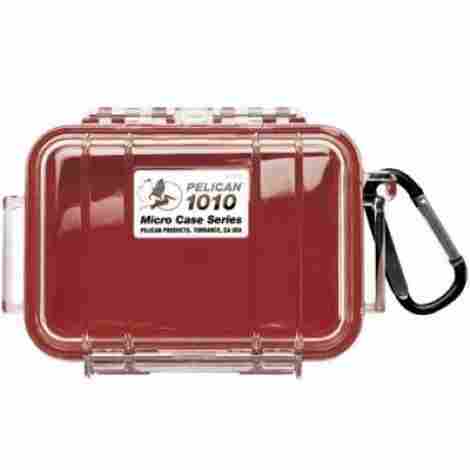 This tidy waterproof micro case is available in five stylish colors; red, yellow, black, aqua and blue, each has a contrasting durable black handle. The case measures a useful four-point three seven by two-point eighty-seven by one-point seventy-one inches so is roomy enough for a wide range of small personal items that need protection from water and moisture. The case lid is clear poly-carbonate and this makes checking kit a breeze and without the need to risk moisture penetration through opening the lid. The Pelican 1010 waterproof case benefits from durable stainless-steel hardware that includes hinges and pins, this makes it longer lasting and reduces the risk of water damage that can disable the functioning of the case. The case has a practical rubber liner to provide improved protection for items stored within, the double feature also acts as an ‘o’ ring seal for better protection against water seepage that can ruin electronic gadgets. The full functionality this Pelican 1010 micro waterproof case represents great value, and this is balanced with the additional stylish design, and the choice of colors - the stainless-steel hardware further improves the value when compared with the cost. This handy sized waterproof case is perfect for keeping ID and other important and valuable personal effects. It is available in three shades, blue, purple and natural clear. The unique design is just the right size not to be cumbersome and heavy when worn around the neck on the safe lanyard, meaning the secure placement of the case is out of sight. The complete waterproofing it offers make it versatile enough for wearing during wet and inclement weather; and is also safe enough to wear during swimming or other water sports. The flip top lid is held securely shut with a durable latch, and the molded o ring holder is robust enough to withstand knocks and scrapes. It is produced with ABS plastic and boasts being crush resistant so is suitable to take on most activities. The Witz waterproof ID case has the versatility to be clipped onto backpacks or belts when the lanyard is not practical. It is sully watertight and this means it floats when in water so shouldn’t create uncomfortable drag around the neck. The balance between both cost and value is reflected well with the tough and robust design, the added waterproofing and crush resistance, and the easy to open and close action makes it a must have safe and versatile bit of kit for any journey. This Crenova waterproof pouch is versatile enough to be worn in a variety of ways which makes it suitable for a large number of activities and sports where waterproof essentials are required. It boasts a triple seal for ultimate protection against water penetration to protect all personal valuables. It is rated at IPX8 which means it is suitable for depths of up to thirty-two feet safely and securely. The pouch measures a useful eight point sixty-six by six inches so is a good size to hold a cell phone, keys and other important personal effects. The pouch is manufactured with soft PVC that offers both durability and a non-intrusive strap, the higher density protection it offers covers water, snow, mud, sand, dust and dirt. The design incorporates a pouch specifically for easy visual of ant cell display. The triple seal is complimented with a heavy duty overlay in Velcro assisting in the protective properties, it offers plenty of room for smaller personal effects that benefit from being in water tight conditions. 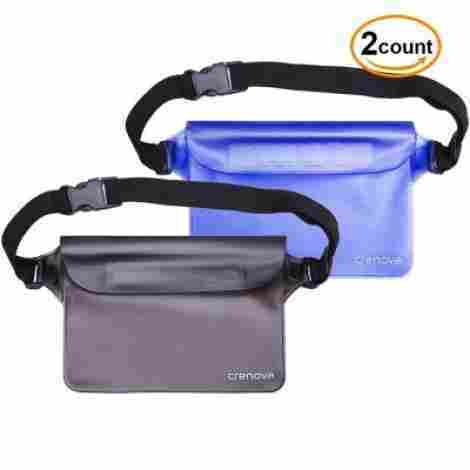 Overall the equality between both cost and value is well balanced, the versatility that is offered with this Crenova BP-02 combined with the practical versatile strap, ensures that this pouch is great value for money and is designed for durability. This practical waterproof case comes in a handy set of four and contains stylish colors, and they are offered with a rating of IPX8 which is waterproof for up to twenty metres below. They boast being protective against not only water, but snow and dirt proof too, this increases its versatility because it allows a multi-purpose use for ant number of sports or activities. It measures eight point three by four by three by one point six inches and it can fit a large variety of different sized cell phones as well as other effects. The clear TPU covers allow full visibility and boasts a full touch screen experience that makes taking photographs under water or in wet and damp conditions safe and with a substantially reduced risk of damaging valuable tech. The easy to use waterproof cases have a snap and lock design is fast and effective to open and close when its needed. 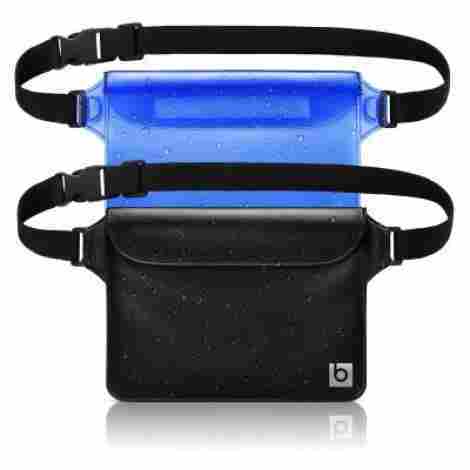 It has a handy strong strap that enables a hands-free carry and also ensures the waterproof case and its contents are always close to hand. The cost and value are balanced well in this case, and the features that include it floating capability and a handy luminous strip that improves visibility even when used at night – ensures that this is overall great value for money. This waterproof case boasts being submersible for up to two hours without risk to the contents; and is rated IPX8 for depths of up to two hundred feet. 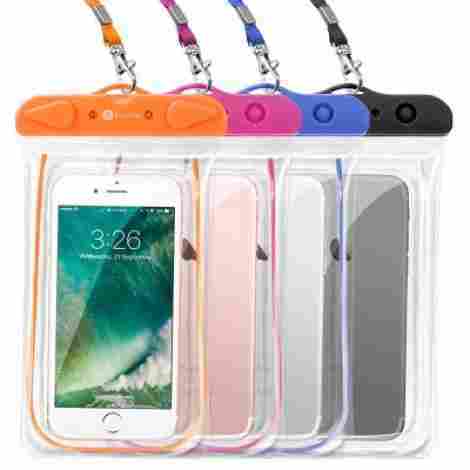 The fully waterproof case is complimented with a handy twenty-one-inch lanyard so enables an easier use for hands free accessibility. The transparent case gives clear visibility and makes touch screen use a breeze through the material allowing photographs and even videos to be taken underwater. The case measures a substantial one hundred five by one hundred seventy-five millimetres and is universally sized to fit a wide range of effects that require protection from the elements. 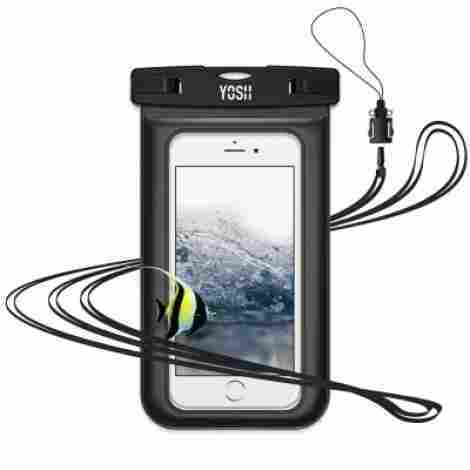 The YOSH waterproof case has a practical and effective sealed clip that is easy to use and prevents any water seepage even under water, and as a bonus – the case comes with lifetime protection; so any queries will be dealt by YOSH themselves. The functional waterproof case comes in a versatile size measuring six point seven by three point nine by two inches; and weighs in at a mere one point six ounces, the size is suitable for most modern cell phones for multi-purpose use. The great functional and practical features that this YOSH waterproof case offers, with the confidence in product and customer service ensures that hard earnt money spent on this is money well spent, and the balance between both cost and value is equal. 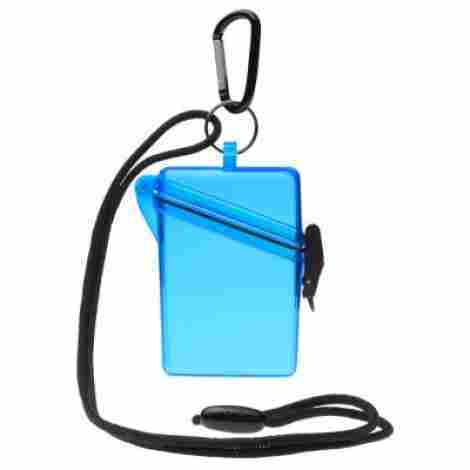 This blue sky basics waterproof case/pouch comes in a useful pack of two for improved cost effectiveness, the strap allows a multi-way positioning and increases its overall versatility. The pack is offered in two choices; two times black or one black with one ocean blue; the size, at nine by six point seven inches is a practical addition to any day tripper and is large enough to hold not only a cell phone, but personal valuable effects such as money and credit cards. The bag is handy and it is easy to use a cell phone through the touch sensitivity that means it doesn’t need to run the risk of water contamination when out of the case. This set of waterproof cases have a triple seal that boasts being immersible in depths of up to thirty-two feet, this improves its multi-use capabilities and means it can be used for a wider range of sports or outdoor activities. The case has a long set of fully adjustable carrying straps that mean it can be worn in a variety of different ways, and it also benefits a one hundred percent lifetime guarantee which increases overall confidence when protecting valuable and personal effects. Considering this set comprises two waterproof cases, the cost is well justified; combined with the functionality offered by its practical triple seal, this floatable waterproof case and versatile capacity makes it excellent value for money. This SNOWFOX waterproof case is designed specifically for an iPhone 6s and iPhone 6, it boasts allowing full access to all buttons and even offers a flip cover for attaching chargers and headphones without having to remove the phone from the case. It has an IP68 rating that boasts being fully certified and suitable for submersing. It offers protection from dust and dirt particles, water, snow and ice which increases its overall versatility and makes it functional for a wide range of sports and outdoor activities when protection is vital. This waterproof case has been designed to be tough enough to withstand drops from over six meters and boasts never losing its overall waterproof capabilities even after prolonged and continuous use; and the snap closure is easy to use. The case is clear so it doesn’t hamper visibility and it benefits from being scratch resistant with a built-in screen protector, it also boasts a transparent rear side and has anti-slip and scratch protection to give it a longer life protecting tech. When taking into account considerations between both cost and value, and combining the added shock absorbance and complete waterproofing, it is equally balanced in both areas and this offers great value for superior tech protection. This practical and functional waterproof case is universal and benefits being suitable for a range of different sized contents, it is available in a huge range of colors and measures in at six point seven by three point nine by point two inches and can fit cell phones with a six-inch diagonal length. It weighs a light one point six ounces and has its own functional lanyard to enable hands free carrying. 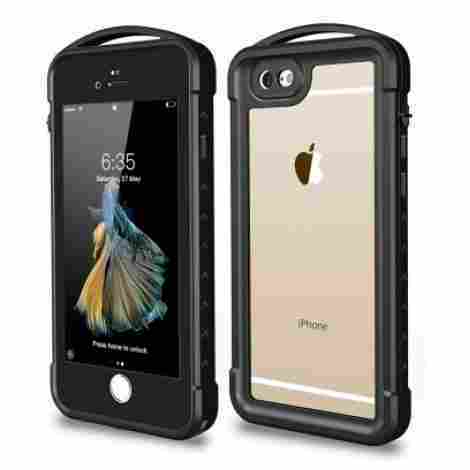 The case has an IPX8 rating and boasts being protective in depths of up to one hundred feet. 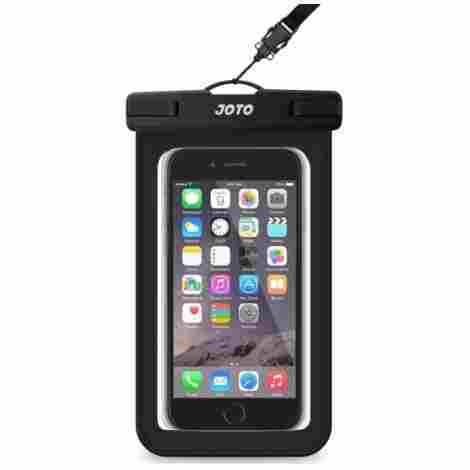 The JOTO waterproof case has clear front side and rear side and makes visibility a breeze, and it benefits from offering multi protection against water, snow and dirt which makes it useful for a number of outdoor sports and activities. The waterproof case is easy to use, with a simple snap and lock feature that allows quick and easy access, the case also enables full touch screen enablement so is ideal for taking photographs under water and out in inclement weather. This practical universal waterproof case has features including the ease of use and the full functionality of its versatile usability. The balance between cost and value is well matched and overall this case is good value for money. 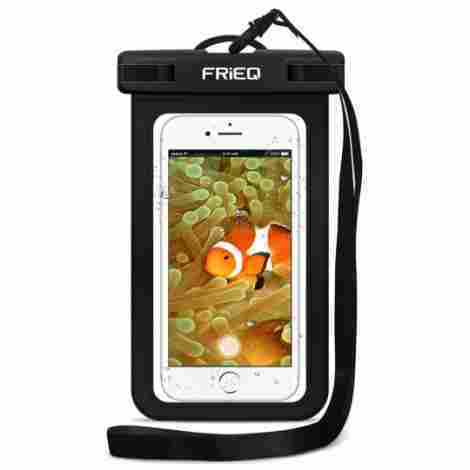 FRiEQ offer this lightweight universal waterproof case with an IPX8 rating for safe submersing to a depth of one hundred feet. It has a detachable strap that is easily attached for when walking, swimming or taking part in most outdoor activities with confidence the contents will not be contaminated by water or dirt. The case is easy to use and creates a perfect seal against water and still allows touchscreen functionality when enclosed within, it is clear on the front and rear allowing clear vision for taking underwater photographs. The FRiEQ waterproof case is easy to use and simply snaps to lock ensuring a full protective seal around any contents, it is fully functional for a wide variety of different sized cell phones or other personal effects that require protection from the weather. The case itself only weighs two point four ounces, and measures eight point three by six point five by point seven inches and this gives a greater versatility around a multitude of items that can be placed inside. Considering the IP rating and immersible depth, along with the universal size and lightweight design, are the functional opening and closing system and the touchscreen capability – this represents both good value and a great price. The process of needing to protect against water and damp damage has evolved dramatically over the ages, our ancestors would have had all the elements to fight against to prolong the life of food harvested and to keep them safe and dry. Initially, it is believed that large leaves were first implemented in the cause of keeping the rain off precious food. This would have been very practical and if you peruse any wildlife documentary today – you still find images of animals actively using leaves to cover themselves in rain. It would have been bound together to create a better water-tight roof for primitive homes and again, this method is still utilized today in many areas of the world. As communities grew, so too did the lust for new horizons and the boat was waterproofed with peat bog produced bitumen to make the boats watertight. Of course; different continents would have used different natural products to provide the seal, tree sap was another favored form of proofing. The growth of settling into permanent homes was the beginning of the waterproofing industry that prevails today, and as technology grew – the waterproofing revolution began to seep into the protection of smaller items, into clothing and footwear – the new uses found for this form of protection reaches far and beyond what the first tree umbrella was implemented for. Centuries ago linseed oil was the go to addition for attempting to make clothing waterproof, going back to the fifteenth century this approach was initiated for the use by sailors who needed to keep water out more so than regular land dwellers. Moving forward came the traditional Mackintosh rain coat, this was great at keeping water out – but unfortunately didn’t let water or moisture out so wearing one was uncomfortable, hot and wet. Modern fabrics use a layering system that includes a waterproofed layer, this may use polyurethane, polyvinyl chloride or rubber, wax is also a good proofer. These materials have an edge over traditional forms because they allow moisture to expel from the inside at the same time as keeping the exterior elements out. Various advancements in technology and in new inventions, mean that there is now a wide array of waterproofing that is designed specifically for designated reasons. And our modern electronics are fast becoming a priority for excellent protection, even with the emerging ‘water-proof’ gadgets; a heavy summer storm may still give cause for concern. A big chunk of the water-proof case market tends to send your thought train to youtravelingng cases, when you go on your well-earned holiday you don’t want to run the risk of a soaked wardrobe when you arrive. That is only the beginning, there are waterproof backpacks, clothing and footwear of course, and more contemporarily – smaller waterproof cases for our personal electronics or papers we have to have with us weather the sun is out or not. Waterproof cases are available in a variety of types, clear cases with a locking mechanism on them are more common today than ever before, this is safer because you can always have a visual on your personal pride and joy when you’re out. A big thing you need to think about is do you need a waterproof case or a water-resistant case? For obvious reaso,ns you should be clear on this before you buy – especially if you want to take your cell phone swimming with you and you only have a water-resistant case. You can also find a great array of solid fixed waterproof cases that attach snuggly around your tech without giving you too many obstructions when you want to use it in the damp. As ever, it’s your call at the end of the day as to whether you opt for a full blanket waterproof answer, or a clear practical and versatile waterproof case. But as long as you plan ahead and anticipate the worst-case scenario – then your choice should protect your tech and other precious personal items from the dreaded water. It may be appealing just to buy a fitted waterproof case for individual items, but when you consider how many personal precious items you have; or are likely to want to take with you on a trip – the practicalities of lots of separate cases may lose its appeal. For one, each case will add onto and increase the overall weight you are going to be carrying around with you, not to mention any weight restrictions you must adhere to on aeroplane flights. There are many waterproof bags you can purchase too, these are useful for when it is more practical to have all your things in one place, for instance if you are back-packing to a destination, or on a shopping trip when you know you are planning to buy lots of goodies. But for shorter trips, or for a daily walk – you may want to consider the versatility a waterproof case can offer you. The sizes available of waterproof cases are vast, and you are sure to find one that suits your personal requirements. You may just want one for your paper maps and cell phone for example, or a single size for taking your camera on an underwater adventure. You may be better to consider a suitable size that can be as useful for one activity as it can for another. Larger waterproof cases are practical because they are lightweight, functional and are easily stored when not in use. There are useful features to be found on a good number of waterproof cases and these can be very useful when you haven’t got enough hands! There are varying sizes of attachments including carabineer catches, elastic straps, belt clips, and rope or twine ties. These multi-functional additions are great when you’re trekking up a tough incline and need your hands to keep you steady, but you still need your map handy just in case you go off track. This can also be a good way to keep your food within reach without having to stop completely and unpack your bag, not always a good idea if your dry clothes are tucked away for later. Keeping important items dry is important no matter what you are doing and it’s not just tech that needs to be protected, choosing a good sized, and versatile waterproof case can make the difference between calling your sodden trip off, or carrying on through whatever the levels of moisture there are around you. So, this simple guide will hopefully have given you a little food for thought whilst you are shopping for a waterproof case. They are really practical and are useful for storing and carrying a huge variety of personal precious items that wouldn’t benefit from being in water or getting damp. 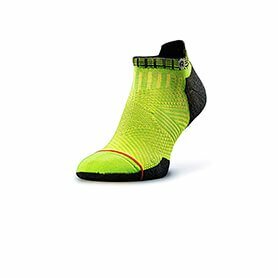 Look for the multi-packs toom and there is also a range of color choices on some brands; so you can mix and match depending on what you are doing and how the mood takes you. Ultimately, always check the level of waterproofing you need before you buy, and if you are using a waterproof case for your tech and intend taking it into the water – make sure the tech can safely be used in or under water to save expensive mistakes. Q. Can I go swimming with my waterproof phone case? A. That depends on the individual case you have, some may be ok to take swimming with you; but you should always check the products individual specification before you take the plunge just in case. And if you want to take photographs make sure you can locate and use the required buttons too. Q. Are all waterproof cases sealed in the same way? A. There are different ways to put the seal into the case, but they are generally a unique flat zip lock that actively squeezes the edges together to stop water getting in. Q. Are waterproof cases breathable? A. Most waterproof cases will not be breathable as this will allow excessive water to penetrate the surface, especially if you have purchased a specifically tested and treated waterproof product, chances are however, if you have a water-resistant case, this may allow a level of breathability. For safety’s sake check the products information before you buy. Q. Do the waterproof cases come with lanyards? A. Some do yes, these are particularly useful if you are on the move and still need to have quick access to your kit. Some also have handy belt clips or clasps so they are versatile enough to attach to your kit bag or yourself which-ever is the most practical. Q. Are these types of case one use only or are they re-usable? A. They are definitely multi-use and re-usable, the material is designed for practical use over and over, allowing it to dry completely between uses is always beneficial as is a quick clean over, to prevent mould build up inside. Q. Do these waterproof cases float? A. Not all do, so check first and if in doubt, you should always attach them to you if you are using them in water, so you don’t lose your kit! Q. Can you use a cell phone whilst it is in the case? A. You should be able to, hearing might be a bit tricky as will the voice transmission, but with practice, you can text and make calls when your cell phone is tucked safely away.